East Kent can overcome negative perceptions if towns across the region have the confidence to capitalize on their varied and rich urban identities, heritage and character. With considerable investment thanks to HS1, ongoing political will and the establishment of several Enterprise Zones, the opportunities are there for other towns to follow in the footsteps of Margate and Folkestone, which are reaping the rewards of investment. 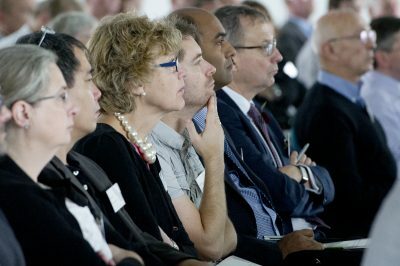 These were the key messages from a high level conference organized by Kent Design on 17 September to consider how growth can be spread across East Kent. The conference, chaired by Design South East director Chris Lamb, began by considering how developers can capitalize on the attractions of the area in the face of low values. Tim Ingleton (Head of Inward Investment, Dover District Council) used Discovery Park in Sandwich as an example of how political determination and close co-operation between public and private sectors turned potential economic disaster into opportunity. The prospects of the site looked bleak in 2011 when Pfizer – who had occupied the site since the 1950s and invested £1.6bn during the 1990s – decided to withdraw. Under the leadership of a ministerial task force, a new buyer was quickly found, and the site was designated an Enterprise Zone to attract new tenants. Today, Discovery Park is home to over 120 international science/pharmaceutical firms and support companies, with 2-3 firms arriving every week. Thanks to close co-operation with local government, a masterplan is informing future development, with further commercial uses alongside education, retail and housing. Abby Raymond (Head of Built Environment, Thanet District Council) challenged East Kent’s negative perceptions. She described how significant investment in Margate had turned that town’s fortunes around, and offered other examples of regeneration such as Folkestone and Ramsgate Royal Harbour that were attracting the attention of new investors. The area’s coastline and rich cultural heritage were major assets, while local and central government is supporting growth and regeneration through a range of measures including further Enterprise Zones, and facilitating discussions with developers to meet housing needs through new urban extensions. Small is beautiful was the key message of Yolande Barnes (Director of World Research, Savills), opening a session examining whether design can be a game changer in East Kent. Offering Austin, Texas as an example, she said that the towns and cities that succeeded in the digital age were those which kept a human scale – a factor which played to the strengths of East Kent’s towns. Highlighting the sustainable urbanism of Canterbury she urged developers to exploit East Kent’s combination of exceptional connections with attractive, people-based towns. History, character and integrity were key factors in the successful regeneration of towns across East Kent, said Guy Hollaway (Principal, Hollaway Architects) as he offered a whistle-stop tour of “metropolitan architecture in a great location”. In Margate, authentic character and powerful historic connections had allowed the town to reinvent itself through its past, with Turner Contemporary and Dreamland the best-known examples of recent regeneration projects. His practice’s quirky series of glazed beach huts at the former Royal Seabathing Hospital were not only offering a contemporary take on Margate’s history and character, but were also examples of how increased values (£534 per sq.ft) can be realized. At Folkestone, the transformational culture-led regeneration in the old town was being followed by major investment at the seafront, reconnecting Folkestone with its greatest asset – the sea – and featuring the world’s first multi-storey skate park in a new development offering a wide range of youth-based activities. Finally, in Ashford, the practice is working on a series of projects around the station to repair the town centre and make the town an attractive offer to commuters and families. John Letherland (Partner, Farrells) explained that shifting perceptions has to start with a close understanding of place. Through a search for clues (history, natural environment), designers and masterplanners can begin to build new identities that are nevertheless authentic and rooted in a place’s past. Folkestone, he suggested, was a place of “elegant disorder”: a town of with many hidden charms which had been disfigured by unsympathetic urban planning. At Folkestone seafront, Farrells’ masterplan was adopting a low-tech approach – extending the creative quarter and existing streets towards the seafront through a plan that mimicked Folkestone’s existing jumble of volumes and colour. Marine Parade – a road that once formed a barrier between the town and the sea – was being tamed through a scheme that re-created lost axes, allowing Folkestone once again to become a coherent and attractive place. Nick Fenton (Chair, Kent Developers Group) offered a dose of cold reality at the beginning of the third session, setting out how persistent negative perceptions, low values and the worst housing crisis since WWII were brakes on growth in East Kent. The area’s excellent transport connections were even, he said, holding the region back as tradesmen travelled to London and West Kent where better-paid employment was readily available. Thankfully, the Kent Developers Group were determined to address these issues through close working relationship with Kent County Council and other partners such as CLG to deliver quality, lobby for further infrastructure investment. Key demands would include broadband connectivity on HS1 to make the line properly attractive to London commuters, and a slicker planning approval regime to assist the industry (and smaller developers in particular). Pragmatic planning was also the key demand of Mark Quinn (Managing Director, Quinn Estates), who agreed that developers were still wary of investing in East Kent. Pragmatic planning would mean area-specific s.106 obligations and a more hard-headed approach to the green belt and AONBs, and efforts to reduce approval times which were currently putting off all but the most persistent and determined developers. Investment funding by the South East LEP was beginning to bear fruit – for example in Sittingbourne where a major mixed-use scheme offered the prospect of greater values – while Ashford commercial quarter was a good example of proactive local planning. Sustained measures such as these, he said, would be crucial if banks were to overcome their wariness of lending for private sector speculative development in the region. For housing developers, investment in good design is crucial, explained Chris Blundell (Director of Development and Regeneration, Golding Homes). A reputation for quality enhanced developers’ ability to obtain land, secure consents, and attract customers. Chris said that while the abolition of overly-prescriptive standards e.g. the Code for Sustainable Homes offered greater design freedom, measures in the July Budget threatened housing associations’ funding streams, in turn jeopardizing design quality as developers are forced to take a more market-focused approach. The conference’s final speaker, Cllr Paul Watkins (Board and Executive Member, South East Local Enterprise Partnership) sent delegates away with hope that further infrastructure investment can underpin efforts to bring growth and regeneration to East Kent. The LEP’s ability to broker political buy-in across the region was encouraging a long view and closer collaboration by developers and local government, and standing up to short-termist political objections to new development opportunities. The expansion of the Port of Dover and the establishment of Enterprise Zones (including Discovery Park) were among several drivers for growth, with a potential third Thames Crossing offering further opportunities. Summing up the conference, Chris Lamb encouraged delegates to consider how a combination of proactive planning and a recognition of East Kent’s uniqueness can bring about growth, increased values, and a continued focus on place in the region.